That car was owned by the late Ben Snyder. He belonged to the HCCA and Ward Kimble got movie jobs for a lot of So Cal HCC members and their cars. As I recall Ben also owned #220. 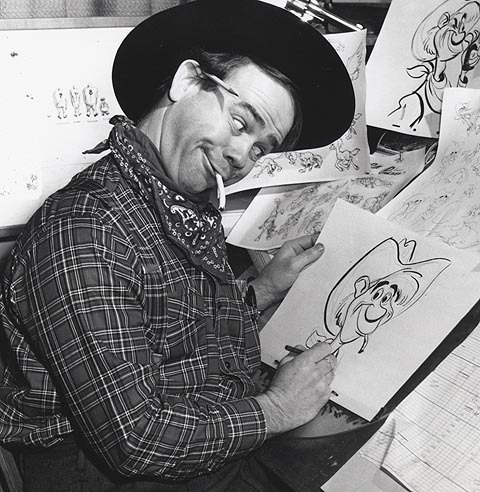 Ward Kimble created Jiminie Cricket. Can we blame our Model T's for our Absent Mindedness? I always enjoyed Ward Kimball's zany artwork in the Early Horseless Carriage Gazette's. He lead a very interesting and full life. Looks like a 1916 to me, based on the seat rivit on the side. I'm thinking that Warehouse sign was probably done by Ward. Don't forget all the cover art on the Gazette done by co-worker, Ben Sharpsteen. Ben always put something funny happening in his cover paintings. One of the Ts in the movie was (is still??) owned by some folks near me in Nevada City. (CA), and yep, a '16 very much like mine! Years ago once when I was in California I visited Ben Synder. The T in question was in his collection. He told me that a section was cut out of the body to make it less wide so it could be bounced on a modern auto. It did not have an engine. Doesn't look like it has any Ford script on the rad and there are no louvers in the rad hood. Fred Upshaw always claimed that his 1961 Montana 500 car was "the Flubber car". I think that the flying one in the movie is narrowed up and that possibly another car, perhaps Fred's was used for certain non-flying shots. In this article Fred's car is mentioned. There is great scene in the movie when he testing the properties of flubber and what it can do and is lifting the engine and other parts into the air at the end of a chain in the garage. 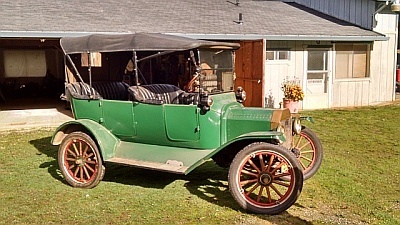 The car driven on the ground was a 1915 owned by Don Jennings, a frequent contributor to the HCCA Gazette many years ago and author of "Three Pedals Down Main Street". Unfortunately Don passed away but the car is now in his son Bill's barn here in Grass Valley. It is a lovely green touring restored by Don and used in many commercials. I bet you couldn't tell it was green by looking at the film! Don told me about his teaching Fred McMurray to drive a T so he could pilot "Gloria" in the film. According to Don the studio was purchasing Gloria for the film but when Don heard they were going to cut her up and hang her from a cable in order to fly he cancelled the sale and referred them to the fellow who sold them the car they used. Later they came back to Don and told him they decided they needed some shots of the car driving around on the street, so they rented Gloria. Unfortunately Bill did not inherit any documentation with the car... that was all verbal history from Don. I wonder if Fred Upshaw's car was used in the movie too, or was he telling tales? In addition to the newspaper article that I posted above that mentions Fred's car as the Flubber car, here is an audio of Fred talking about the 1961 Montana 500 where he mentions driving the "Flubber Ford". He mentions it at about 3:50 in. He also says earlier in the recording that he was driving a 1915 roadster, which is not true. In fact Fred "misremembered" several things about the run. Fred Upshaw told me he owned the car that flew. They removed non essential parts to make it lighter. 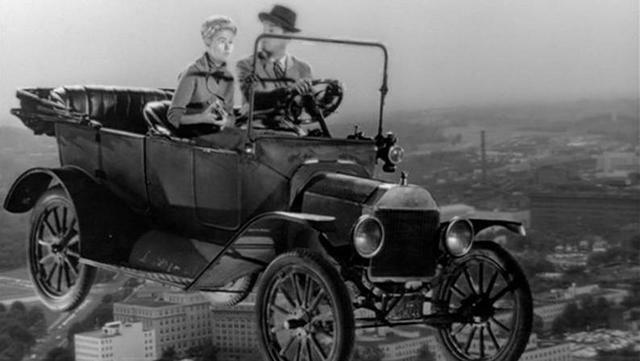 I find it hard to believe the claim made by Don Jennings that he taught Fred to drive a T. Fred was born in 1908 and was in other movies well before this one. 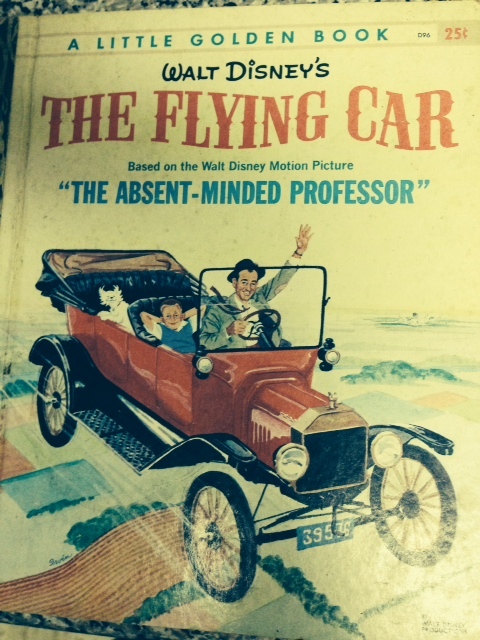 If you look in the book "Henry's Wonderful Model T" you will see a picture of a young Fred driving a T. The book was published in 55 and the Flubber movie came out in 67. I just find it very hard to believe anyone born in 08 not having one of his first exposures to driving a car and it not being a T. At least half of the cars on the road during Freds early years were T's. 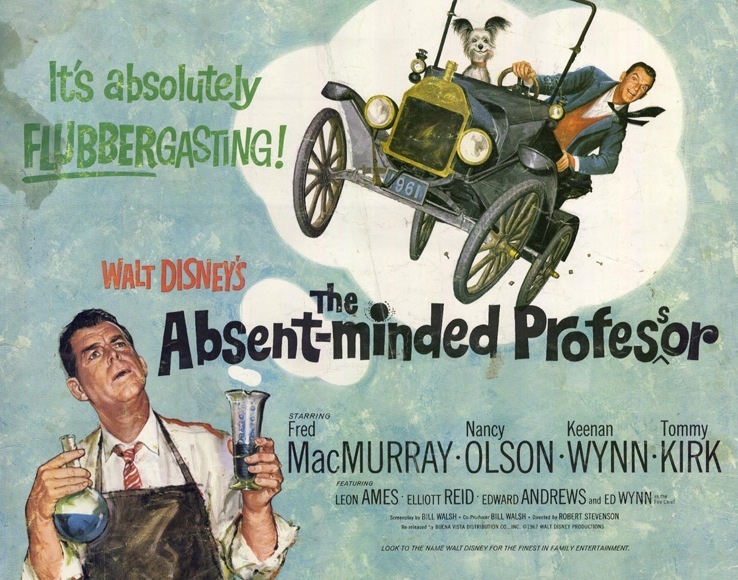 The Absent minded professor film we're talking about in this thread was first released in march 1961, then rereleased in 1967 and 1975 to movie theaters back in those pre home video days. 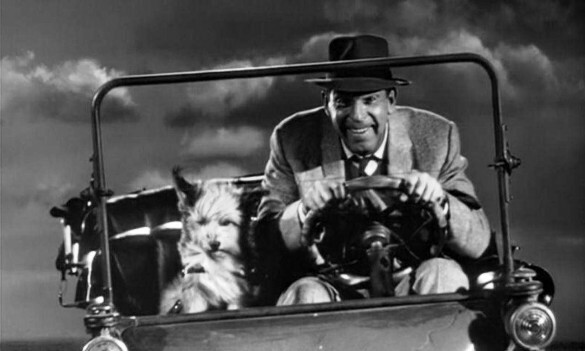 Either way, there are movies with Fred driving a T before Clymer published his book in 55. I looked at the movie date on the poster and thought it said 67. Could have been 61. Doesn't change the fact that I believe Fred already knew how to drive a T.
I am so old that I saw that picture at the Frontier Drive in theater located where the Valley View Sports Arena is now located in San Diego! That was sometime around 1960. Thought I'd bump this one before the 2014 forum is closed. In some of the pics, the passenger side oil lamp is missing. That's pretty absent minded. Last week Bill got Don's car "Gloria" out of 15 year storage. I was there helping to roll cars around as Bill is recovering from shoulder surgery. Gloria looks just as nice as when Bill stored her. 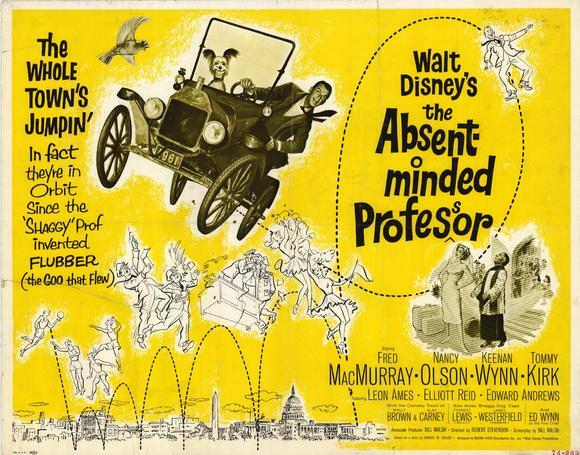 She was used in numerous films and commercials in the 50's and 60's including Absent Minded Professor. Bill gave me a bit more of the car's history. 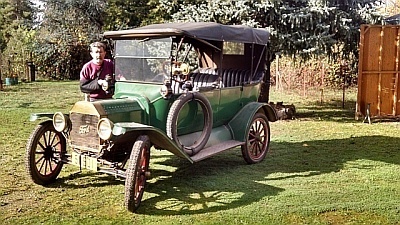 Don, Bill, Mom and Sister used to get piled into "Baby Doll", their 1915 roadster for tours all over California in the 50's. Eventually Don figured out that a touring car would fit the family better. So he obtained lots of pieces and set Bill to assembling the car after school in his afternoons. Don would come home from work and check the progress. Gloria was the result, she became the families tour car as well as bringing in some cash from Hollywood. The film was black and white so you didn't notice that the car driven on the ground was green! Here's what she looked like last week! 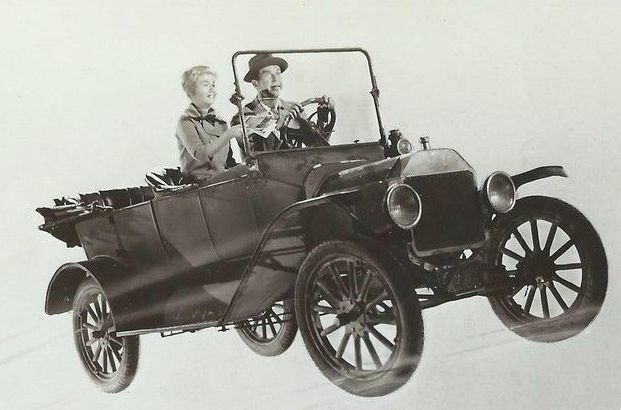 I grew up in the age of re-runs but I remember the episode of 'My Three Sons' where Fred MacMurray bought one of his sons (I think it was Robbie) a Model T as his first car. He hated it until his friends took a liking to it and its "original bud vases". The car in the picture posted by Royce is a different car than the rest. Look at the side lights. All brass with different shaped tops. 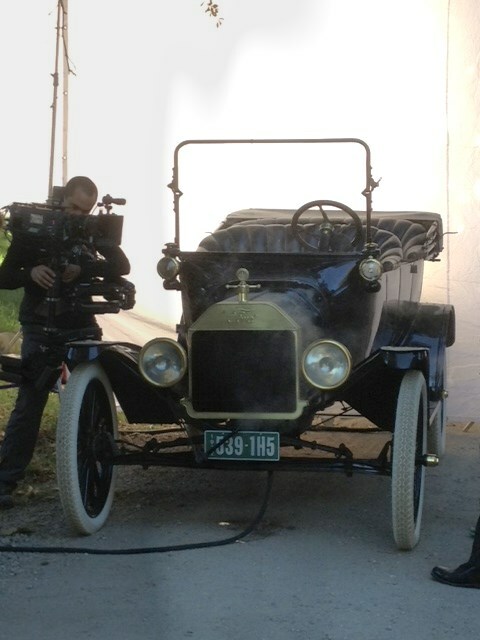 Again, there were at least two "cars" used to film the movie. One, a real whole car that Terry gives us an update on. And a mock-up used for special effects shots. Hence the different lights and things not looking quite right. The mock-ups I have seen in some museum and display photos does not look like it does in some of the film stills. I wonder if that is due to post-filming special effects? Or more than one mock-up? Another interesting (at least to me) side-note about the flying car mock-up. Years ago, I read and saw photos including an interview with Albert Einstein. 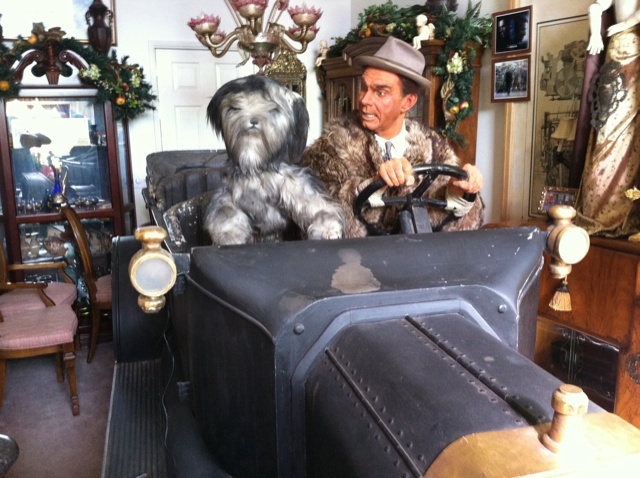 Late in his life, Albert and his wife got a guided tour of Disney Studios. While there, he and his wife were sat in this strange contraption that looked like a model T, and bounced around for awhile. Later, after finishing the tour, he was given a souvenir film. 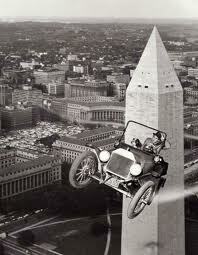 Watching the film later, he got to see himself flying all over the world visiting numerous famous landmarks in this remarkable model T. The quintessential genius admitted to being amazed and wondering aloud "How such a thing could be done?" This probably occurred about the time filming was being done on the movie and the mock-up with back-screen was still set up. I wonder if a copy of that film still exists? Thank you Jay, and Terry, for bringing this forward. 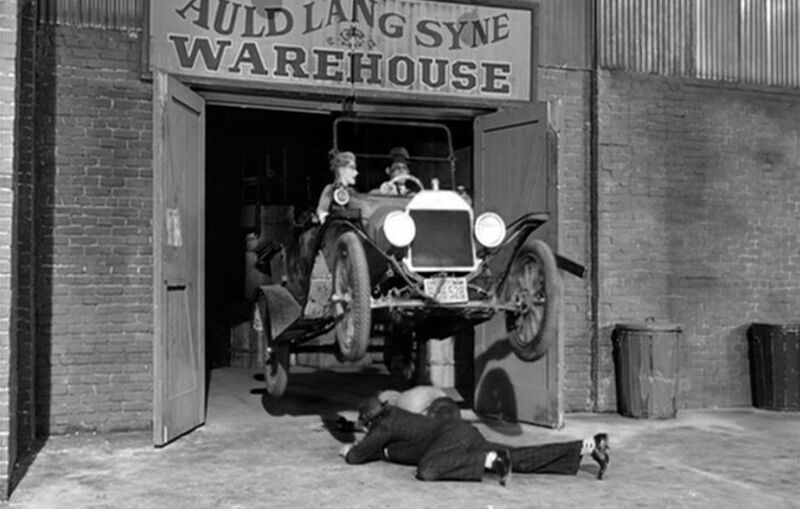 The episode was Chip On Wheels.The car was a Model T coupe. I drove Gloria to Big Bear on a tour back in the early '60s with Dons daughter Donna, who I was kind of dating at the time. I remember I had to use low pedal all the way up the mountain, and when we got there, I couldn't unlock my knee! 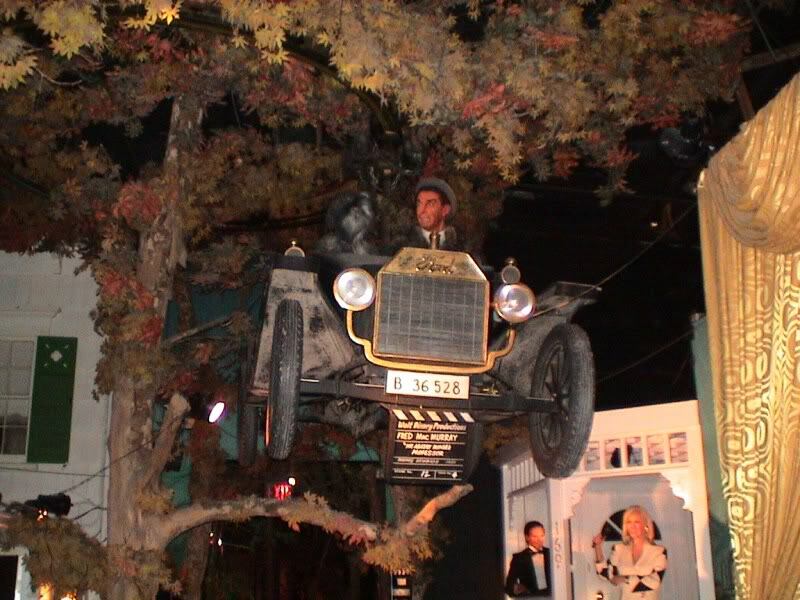 I was visiting a museum in Reno some years ago and it was claimed they had the/a mock-up of model T used in the movie. It has a considerable amount of styrofoam throughout for weight. An interesting note when I visited the museum and learned that they had the mock-up model I had noticed the steering wheel was on upside down. We had a discussion about the steering wheel installation and the curator was sure that it was on correctly and I was just as sure that it wasn't. They produced some of the original photos and the dilemma was resolved, the steering wheel was promptly turned over and re-installed.